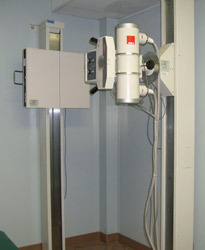 We have a x-ray machine on-site for your convenience. Welcome to Sims Chiropractic Center! Prior to your office visit, we suggest completing your health forms. If you have not we encourage you to arrive at least 15 minutes early so it does not delay your visit with our doctor. You will complete a health questionnaire which will ask you various questions about your reason(s) for visiting as well as questions about your past medical history. Prior to seeing the doctor you can expect a tour of our comfortable office and learn about our practice and doctor. In addition, you will see a brief 5-minute video before meeting the doctor. During your consultation with the doctor he will ask you very specific questions about your reason for visiting, diet, hobbies, habits, previous medical history and other physicians seen (MD, DO, etc..). This process is extremely important for the doctor to be able to understand your complaints and be able to perform a proper evaluation. Based on your history information, the doctor will perform tests based on standards of care in order to rule in or out certain conditions. He will also perform a neurological, orthopedic and chiropractic examination to determine the cause of your condition. Dr. Sims will palpate (touch) your spine and asses its overall integrity with skilled hands. Structural abnormalities in your spine may be discovered during your examination and these may be affecting or causing your condition. Dr. Sims will likely refer to the structural abnormality as a misalignment or subluxation. If Dr. Sims feels it is necessary, he will recommend taking X-rays, laboratory analysis or other diagnostic procedures. We have an X-ray machine in our facility and are usually able to take these fairly quickly on this day. Our goal is to make your first visit as comfortable as possible so we can design a successful care plan for you.